Our Favorite Disney Food Guide is back and bigger than ever! For those of us who love Disney ABOUT AS MUCH AS we love our food, this guide is for US! The Disney Food Blog is the place we turn to for ALL our food-planning strategies for Disney World and the guide that they put out every year is the Bomb Diggity of all Food Guides. Second, it’s portable: download it to your computer or carry it around on your phone. Third, it’s unrivalled: there is no other place you can go to find this much info about planning your dining at Disney World than this guide. 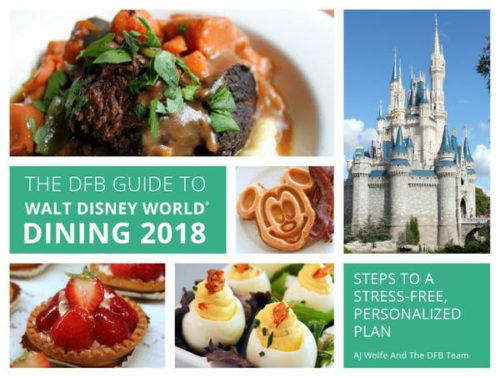 Menus, review, planning worksheets, the ins and outs of the Disney Dining Plan, plus a Bingo game: the DFB Guide to Walt Disney World Dining is where it’s AT! Plus, they’re offering a code for 25% off the guide when you enter NEWS2018 at checkout. We’re not sure how long this code will last, but it’s working as of 1/10/18!